Lithium Labs – Enterprise App Developers » What SAP Netweaver Gateway is NOT …. ! 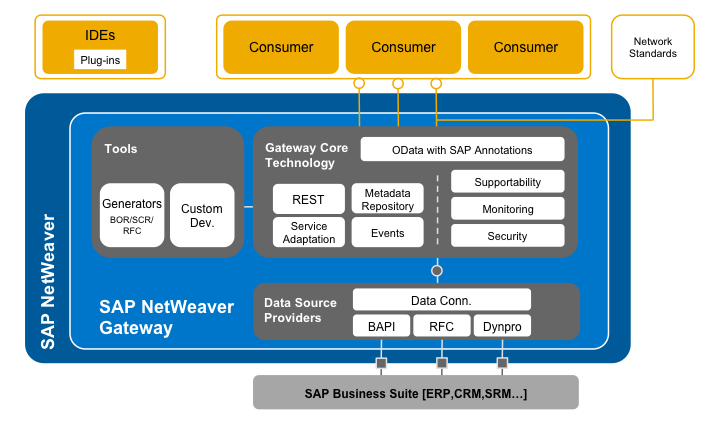 What SAP Netweaver Gateway is NOT …. ! I believe that there is a lot of talk online where people are asking the question … Why should I use Netweaver Gateway if I have Netweaver Process Integration (PI) or vice versa. I was recently on a SAP mobility call which included a great slide entitled “What SAP Netweaver Gateway is and is not!”. I thought I would share this with everyone and a couple other posts and links I have come across on the web, which hopefully people wanting to learn more about what Gateway has to offer, will find useful. - The SAP Gateway process in the Netweaver Application Server ABAP that enables external communication (e.g. RFC).